We woke to dramatic skies and wind whipping across the sea surface, and opted to start the day with a sail to somewhere that looked like it wanted us a bit more. Keep your eyes on the horizon. Even during conversations with other people, look at the horizon, not in their eyes. Explain to them what you’re doing so you don’t seem rude. Stay outside in the fresh air, on the deck closest to the water. Face the same direction the boat is going. Don’t go below decks. Sip a ginger beer. Don’t worry, it has no alcohol, and is an old remedy for nausea. Take a dramamine. It might put you to sleep, but a forced nap while on vacation is great. This morning we were confronted with a bumpy crossing of the Sea of Abaco, and I was glad to see many of our guests employing at least one of these practices. The yachts we charter are these big 52-foot catamarans, and they’re very very stable, but they still act more like a boat than a Lincoln Continental. 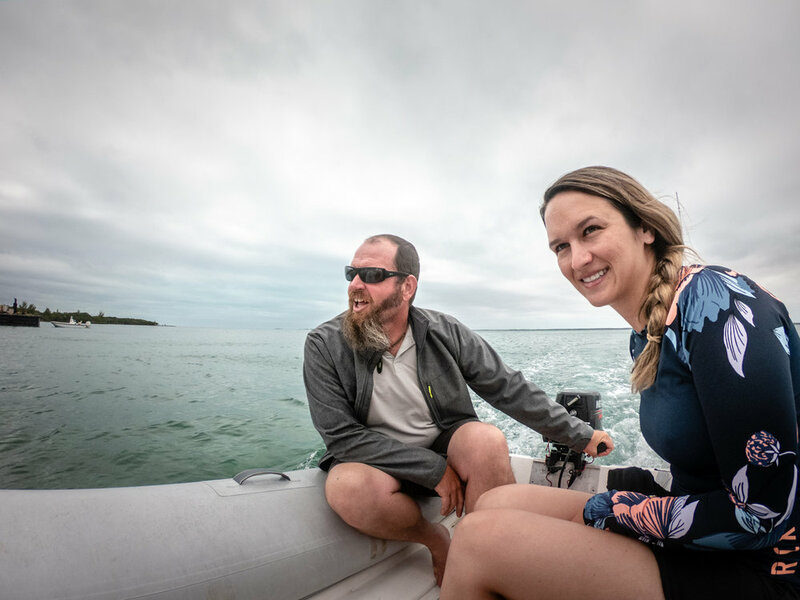 In about a half hour, we were in the calm waters of the harbor on Green Turtle Cay, filling the boat up with water and stretching our legs on land. Nobody was green. Every day, every sail, Cecile rides the bow. We swim with pigs. They reside on No-Name Cay, and swim out to us when we bring them vegetable scraps. They’re photogenic, impossibly cute, and one of them bit Heather on her leg when she wasn’t looking. She’s going to survive, but might feel differently about them now. An hour later we were pulling into a little bay between Manjack and Crab Cays. Our swim along the coral edges of the island was amazing, with all the typical reef life showing up. Heather took Marianne and Lexi on a long reef life tour, spotting two different kinds of anemones, lots of cool fish behavior and more. From a majestic Southern Ray with a 4’ wingspan, to our first puffer fish of the trip to baby Sergeant Majors, we saw it all. The sun finally peeked out as we played on a swing set built for the sea. Gin and tonics welcomed us aboard, with a table full of appetizers. Miriam said “voila’” and cornish game hens with black rice Molinet and spinach salad appeared. We rolled into the evening with some games, and uproarious laughter ensued during the charades portion of a SwimVacation classic game we don’t know the name of. We catch ourselves staying up a little later tonight, perhaps not wanting these special days to end.